Monday’s notice that San Onofre’s owners are laying off 730 workers—one third of the workforce—is yet another indication of a nuclear power plant in severe distress. Both formerly operating reactors have been shut down since January due to revelations that key components called steam generators had rapidly and largely turned into junk. In following months promises of restart from the company have repeatedly been pushed back. Southern California Edison has an 80% ownership share in the San Onofre nukes, with San Diego Gas & Electric holding most of the remaining share. Despite the crippled status of San Onofre, its owners are still raking in $54 million per month while its reactors provide not one electron of power to its 1.4 million customers in San Diego, Orange and LA counties. That division of the state Public Utilities Commission “lobbies on behalf of utilities customers,” the newspaper reported. State law mandates that the PUC can “pull the costs from consumer bills” if generating equipment “is off line for nine months or more,” the paper reported. 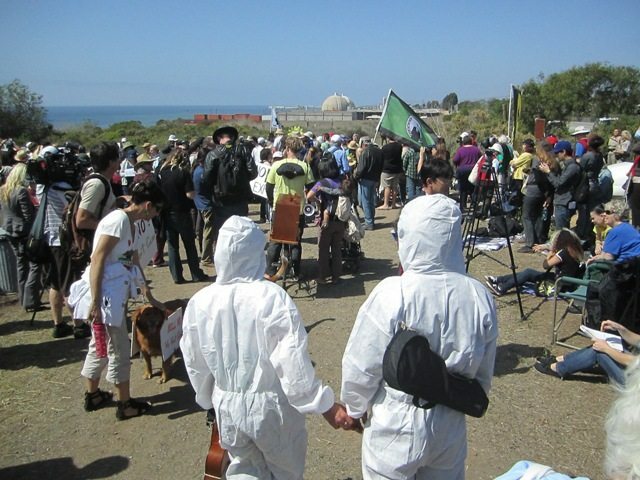 “I write to ask you to remove [San Onofre nuclear plant] from [SC Edison’s] and [SDG&E’s] rate base now, instead of waiting several more months and allowing hundreds of millions of dollars in needless costs to be borne by customers. While San Onofre’s owners witness their former big moneymaker becoming more and more of a liability, they also have to face the reality that, even if they did want to get Units 2 and 3 running again, they probably would have to replace all four steam generators. The last time they did that (only a few years ago), it took over two years and cost $680 million. Steam generators usually last 20 or more years. But maybe now, just maybe, they’ll finally get real and realize nuclear power just ain’t worth it. « The Starting Line — The DeMaio Campaign: Today San Diego, Tomorrow California? While it may be time to shut this plant down and get rid of it, I DO feel sorry for the seven hundred and thirty odd people (plus more if it does shut down for good) who are losing their jobs. That’s never something to be happy about, even if this plant’s time has come and gone. This is an important wake-up call for Southern California…to take notice and to finally have something real to be afraid about. They better shut it down now. With a skeleton crew (less 730 workers) how are they going to maintain safety?